As you may know, ATI released their 4800 series a little over a month ago. 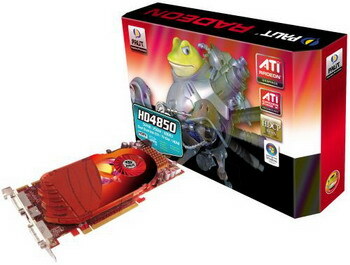 Since then, ATI has really shown NVidia the door, offering outstanding graphics cards at a significantly cheaper price. Recently, Palit sent us their ATI Radeon HD 4850 graphics card to test and see how well it performs. Lets see how it weighs in. ATI Radeon™ HD 4800 Series GPUs bring the power of graphics ‘supercomputing’ to gamers, setting a new standard for visual computing. Redefine the way you play and take HD gaming to the extreme with best-in-class performance. With one teraFLOPS on tap, the TeraScale graphics engine delivers an impressive, cinematic gaming experience. Add this graphics card to your PC and watch Blu-ray movies and play HD content with incredible visual fidelity or take your experience to another level with new multimedia capabilities. Do it all with break-through efficiency that doesn't compromise performance. The new TeraScale graphics engine combines the power of one teraFLOPS, 800 stream processors and next generation GDDR5 memory to propel you deep into your game play with seamless frame rates and high resolutions. TeraScale Graphics Engine - The new TeraScale graphics engine features over one teraFLOPS, nearly one billion transistors and 800 stream processors so you can enjoy the high resolutions and fast frame rates previously only available with dual-card systems.